February is almost here and, as a movie lover, I am looking forward to the upcoming Academy Awards show. Guess what? NCP has its own Oscar promotion coming up! I’m so excited about it! We’re rolling out the red carpet for you, our panelists. You’ll be the ones predicting who will win the Oscar in some of the major award categories, and you will be a winner, too! Each week, for four weeks, we’ll ask you to pick who you think will win an Oscar in a few select categories. • If you select the Oscar winner for that category, and you transmit that week, you’ll earn an additional 1,500 points! • If you don’t select the Oscar winner, but you do transmit that week, you’ll still earn an additional 1,000 points! Gift points will be awarded after the Academy Awards presentation, which is scheduled for Sunday, February 28. For the first week of the promotion, the category will be Best Actress. You will make your prediction by answering a survey included in the email you receive. So panelists, make sure you check your email inboxes early next week for the promotion details! Brrr … it’s cold here in the Northeast, and we have an impending blizzard on the way, ugh! Please keep an eye on our Facebook page for news about any closings and check your message center on the NCP website, too! Speaking of cold weather, who wants to go out shopping when the wind chill is below zero? Not me, that’s for sure! Shopping from home is one of the great conveniences we have and what better place to shop then on our NCP Rewards+ site! Are you familiar with Rewards+ (“Rewards Plus”)? NCP Rewards+ is a marketplace where members can purchase discounted products and services from a wide variety of participating merchants. You can save on travel, clothing, jewelry, movies, and more. This is a special bonus program that is separate from regular panel membership. This is a free program: There is NO COST to join and NO ANNUAL FEES. The only money you spend is on your own discounted purchases! Your NCP panelist gift points are completely separate from the “Wow Points” you use/earn in the NCP Rewards+ program and will never be used for NCP Rewards+ in any way. When you enroll, a separate email will be sent to you from “NCP Rewards [cs@affinityperks.com]” with your account info and instructions for logging on to the marketplace site. To be eligible, you must be an actively participating panel member with a valid email address on file. The account emails (mentioned above) will typically be sent on Tuesdays, so depending on when you enroll you may have to wait until the following week to receive it. Looking for something for your Valentine? Well, check out Rewards+ for special offers! Not yet a member of NCP Rewards+? Click here to get in on the savings. If you have any questions or suggestions for this blog, let us know! Just email me at news@ncppanel.com. Make sure to use the subject line “Suggestions.” Thank you. Didn’t Win Powerball? Maybe You’ll Be One Of Our Sweepstakes Winners! I read that the odds of winning last night’s $1.5 billion drawing were just one in 292.2 million. Well, NCP can give you much better odds than that! All panel members who scan their purchase information and transmit the data to us at least once a week are eligible for all of our sweepstakes – and we have a lot of them! This year we reworked some of our sweepstakes, so here is some information about them. Be on the lookout for additional special sweepstakes and promotions that run at various times throughout the year. As you can see, you have much better luck winning one of our sweepstakes! No going to the store for a ticket … you just need to scan and transmit every week and you’ll earn your entries. Welcome to a brand-new year! I hope you had a great New Year’s celebration. I also hope you made the resolution to be an even better panelist in 2016! 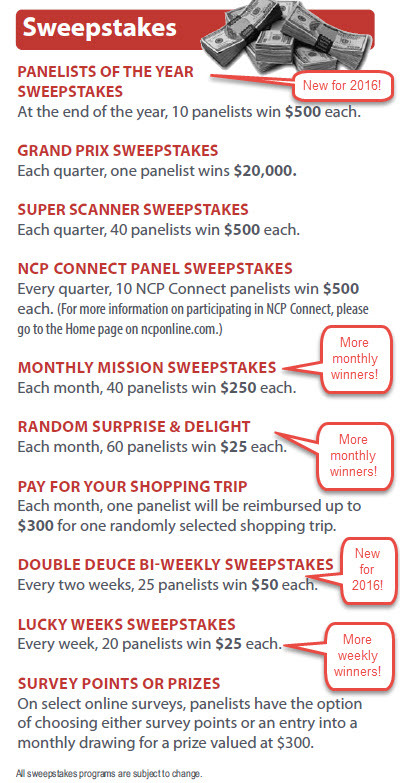 Remember, NCP’s New Years’ Sweepstakes is still going on. The sweepstakes runs through Saturday, January 16. If you scan and send us your purchase information, you’ll be entered into a sweepstakes where you could win either 5,000 Bonus Gift Points or a $25 Visa Gift Card. Got A Good Tip Or Two For Us? One thing we’d like to do in 2016 is to create a “tip of the week” video on YouTube. Please send your tips and tricks to news@ncppanel.com. Make sure to use the subject line “Tips.” Thank you. We can’t wait to read your tips! I don’t know about you, but everywhere I go I see something related to Star Wars. So I just have to ask: Have you seen the latest Star Wars movie? If you did, what did you think of it? (I haven’t seen it yet, but hope to soon.) Have you bought any Star Wars merchandise? Whether it’s a t-shirt or a coffee mug or a can of soup, there are so many things on the market. If you did buy something, don’t forget to record the purchase!